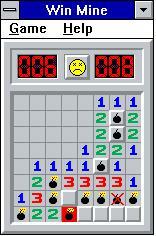 Mine 2.9 is a Beta version of Windows Minesweeper never officially released. The menus and bomb graphics are different and Expert is 24x24 instead of 16x30. See the Wiki for more information on this early version. It was found, in an online collection of files uploaded to defunct BBS sites, by Damien Moore in July 2010.